Are you supposed to get no dialog boxes popping up, when you restart the computer i am getting this file security warning popping up. Can i get rid of this. 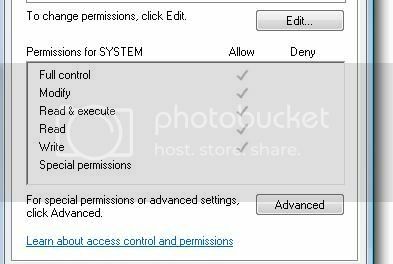 Check Ave thumbnail sizer executable Properties and Unblock it. 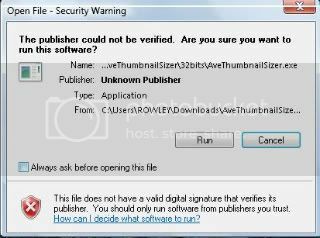 I just downloaded and tried AveThumbnailSizer.exe -hide and it works fine. Yes, this is the easy bit, but adding the (-hide) switch , still brings up a file security dialog box, its this box that i don't want on the screen every time i start the computer. I could go into windows firewall and stop the security warnings, but i don't know if its worth doing this. take control of the file giving it full rights. or enable test mode. one of the two might work. It looks like an unsigned driver issue..
And guess what No dialog box. I do not know what happened the first time, as i checked everything about 10 times, i can only think something went wrong the first time i installed it. Hi - I have installed the 32bit version; the install seems successful except the width & height settings (for thumbnails) always revert to the defaults. This despite my clicking the "Start AveVista...with Windows" button as instructed. The software does start with Windows, BTW. And I much like its effect after I set the width & height - just do not want to do this every time I boot up. It's not supposed to act that way, is it? I tried removing the program and reinstalling. No difference. Try to run the executable (.exe) as Administrator and then set the width and height of thumbnail.